(TibetanReview.net, Sep24, 2017) – China’s official media has on Sep 21 defended the country’s decision to defund Chinese scholars who wish to pursue their scholarship at the University of California, San Diego (UCSD), saying Western universities should offer students a true picture of history, including Tibet’s. 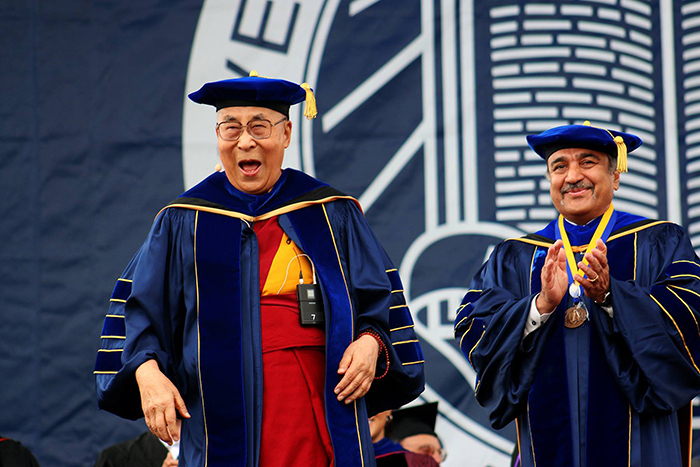 And its grouse against the UCSD was that by inviting Tibet’s exiled spiritual leader, the Dalai Lama, to its commencement ceremony for the 2016-2017 academic year in Jun 2017, the university had failed to live up to that requirement. It was earlier reported that the China Scholarship Council (CSC), a branch of China’s Ministry of Education, had frozen applications by Chinese scholars for state funding for study at the UCSD. This was seen as retaliation against the university for the Dalai Lama invite. The report by globaltimes.cn, which is run by China’s party mouthpiece, the People’s Daily, said that as one of the top universities in the world, UCSD should offer students an objective picture of Tibet. But regrettably, it continued, the university called “the political exile” “a man of peace” and used “freedom of speech” to challenge China’s territorial integrity. The report accused the UCSD of having hurt the feelings of the Chinese people, vowed not to treat it like before, and said putting a freeze on CSC-funded Chinese scholars to the university may not be the end. Calling the Dalai Lama invite “a serious challenge to China’s territorial integrity”, the report delivered a good measure of sidekick to the Western media as well, telling them to “learn more history before judging the Chinese government”. The report boasted that China today had greater influence in the world and consequently greater say in international affairs and that a growing number of Chinese students had gone to the US for study to better contribute to China’s development. The report hoped other Western universities will get a lesson from China’s reaction to the UCSD’s invitation to the Dalai Lama and offer students “a true picture of history, including Tibet’s”.